Dimitrios (ATHENS, Greece) on 14 March 2008 in Architecture and Portfolio. Wow, D. this is an amazing sky you captured! Great pic. When she was four years old, my youngest daughter called these contrail lines in the sky "sky-scrapers." @Viewfinder: wise child she was, hope she becomes a conserned citizen of the world. 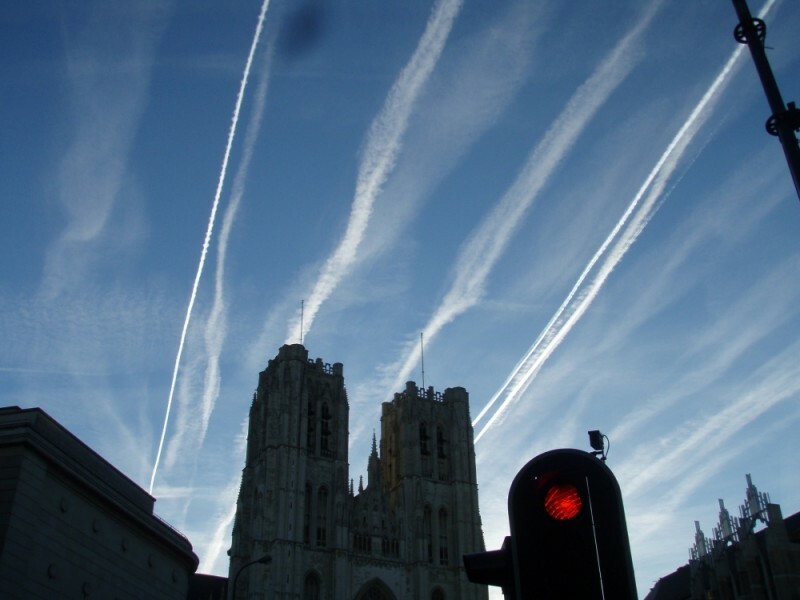 Wow, the streaks in the sky are really beautiful! Wonderful capture. Must be an Airport nearby. They look like trails from jets. Makes for an interesting picture. Great capture of the sky, but without the red light or the buildings, it would have little interest. Terrific angle, beautiful light, nice timing! Have you moved to Brussels, D? Wow, what a chance and you grasped it very well! This is using your waiting time effectively! Very, very beautiful and impressive, it makes you watch longer and several times, thanks Dimitrios! Very good picture. The lines in the sky brings the eyes to the cathedral. I like that you add the red light next to it. May be you could clone out the object in the right -up corner. Nice shot. There is a mathematical balance to it. @tokyo-drifter: glad that you saw the equation! Great capture of the sky. Very well done. Nice capture!!!! Χριστός Ανέστη! Χρόνια Πολλά! Great sky according to the architecture. Great effect. Congrats! !